In the summer of 1967 Herbert Marcuse gave a talk titled ‘Liberation from the Affluent Society’ at a London conference called The Dialectics of Liberation. 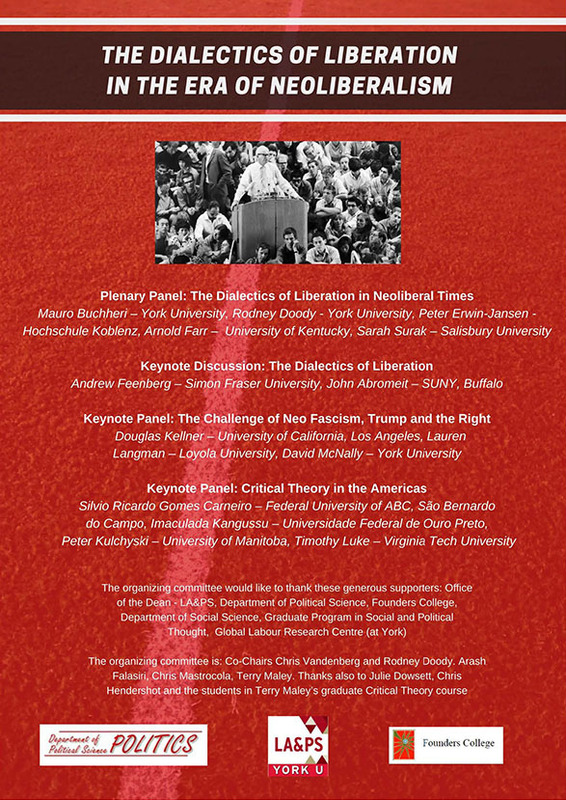 The conference brought together a wide range of left and counter-cultural activists, thinkers, artists and poets – Herbert Marcuse, R.D Laing, Paul Sweezy, Stokley Carmichael, Allen Ginsberg, and Lucien Goldman, among others. It is in the spirit of that event, and to mark its 50th anniversary, that the International Herbert Marcuse Society is holding its 2017 biennial conference at York University in Toronto, Canada, Oct. 26-28, 2017. The theme is: “The Dialectics of Liberation in an Era of Neoliberalism”. For this year’s conference, we invited papers and panels that look at Marcuse’s work through multi-dimensional lenses. How is Marcuse’s (and other critical theorist’s) work relevant to today’s struggles against neoliberal capitalism? How can it help build the capacity for new sensibilities, critical pedagogies and new ways of thinking and organizing on the left today? And what are the dialectics of liberation in a context marked by crises, deepening authoritarianism, economic distress, social disintegration, and forms of oppression that mark neoliberal societies today? How have recent movements – Black Lives Matter, Indigenous/Idle No More, ecological, anti-austerity and others – sought to theorize, understand, refuse and go beyond neoliberalism? How do radical critiques today echo and/or build on those that came together at the 1967 Dialectics of Liberation gathering? In what ways are the challenges of liberation different today, against the backdrop of the Trump phenomenon and the rise of a neoliberal, neo-fascist right? And how does Marcuse’s critique intersect with current assessments of neoliberalism inspired by political economy, labour studies, feminism, Indigenous struggles, radical democratic and anti-racist theory, critical pedagogy and current debates within critical theory? Participants this year incude Critical theory scholars and students–as well as scholar-activists and independent scholars from other critical traditions such as political economy, feminism, LGBTQ studies, disability studies, post-colonial studies, Indigenous studies, critical race theory, and labour studies – to engage in a dialogue with Marcuse, in the way that Blackpower, feminist, and ecological participants and activists did at the 1967 Dialectics of Liberation event. We welcome interventions and reflections on how Marcuse and other critical theorists see the ‘dialectics of liberation’ today. 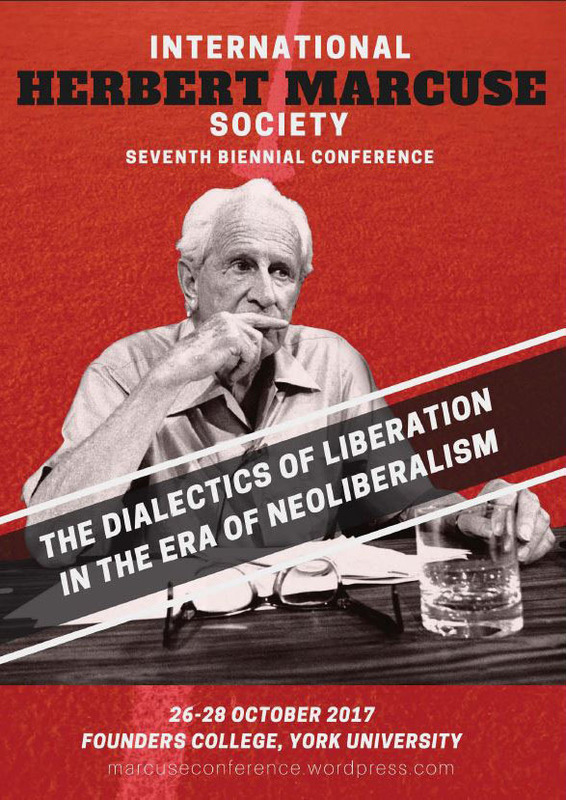 And even though the emphasis this year is on liberation from neoliberalism, we also do not want to neglect the roots that the ‘dialectics of liberation’ have in the rich philosophical and social theory heritage of Marcuse’s work, in his own debates with Hegel, Marx, Freud, Fromm, even Nietzsche and Heidegger, as well as critical theorists such as Adorno and Benjamin. There will be papers and panels on Marcuse’s relation to these thinkers as well. The conference organizers are particularly interested in encouraging undergraduate and graduate student participation. To this end, we encourage faculty colleagues to bring students of all levels to the conference. Undergraduate students are invited to present papers in special concurrent sessions. The conference is an interdisciplinary, multimedia engagement with the many dimensions of Herbert Marcuse’s work. In addition to the presentation of papers, the conference will also present artistic/cultural work, including an installation/exhibition by documentary film maker Peter Davis, who filmed the 1967 Dialectics of Liberation event.